Muhammad Rahim-khan madrasah is located east of Kunya-Ark. The full name of khan is Said Muhammad Rahim Bahadur Khan. Local people called him Madraim Khan II. The construction of madrasah was begun by Seyid Muhammad Rahim Khan’s order and was completed in 1876. The immense building consists of 76 hujras, two courtyards, darshona, winter and summer mosques and library. It is a rectangular building with ayvan and small towers at the corners. Here the students studied not only theology but also science. There were often held literary evenings – mushoira where one could hear the works of outstanding poets of Khiva. The yard is surrounded by one-storey hujras inside which dominates a two-storey building. Its facade is decorated with a giant portal, where you can see the remains of blue majolica. There are high buildings-guldasta in the corners of madrasah. Rahim Khan II was a talented poet and philosopher who wrote his works under the pseudonym Feruz Shah. During his reign there was held the reform of traditional education. 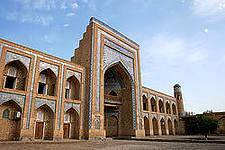 Thanks to it, the first schools appeared in Khiva, where besides Arabic alphabet and reading the Koran, students studied secular sciences. One of the most important historical events came about in 1873 during the reign of Muhammad Rahim Khan. The royal army of Russia invaded in Khanate, which was the cause of Russian protectorate in the country. The monumental building madrassah Muhammad Rahim Khan is one of the largest educational institutions in Khiva, dominating the other buildings of the city and reminding the flowering of art and science of XIX century.